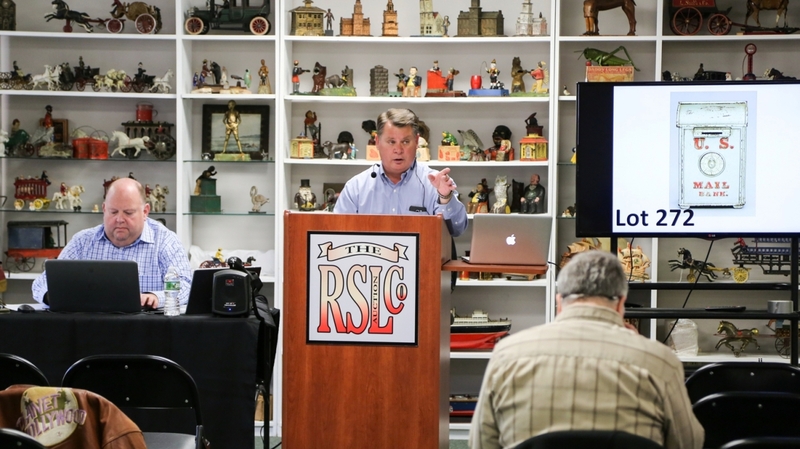 WHITEHOUSE STATION, N.J. – The still bank collection of Elliotte and Liz Harold combined with the German and Japanese windup toy collection of Sandy Fubini to form the core of RSL’s two-day, 1,289-lot March 23-24 sale. The auction would attract 56 floor bidders, 67 absentee bidders, 35 phone bidders and an additional 678 internet bidders. Buyers came from near and far to bid on the choice examples offered from these two esteemed collections, pushing the gross sale total to $985,560 with a 98.7 percent sell-through rate. 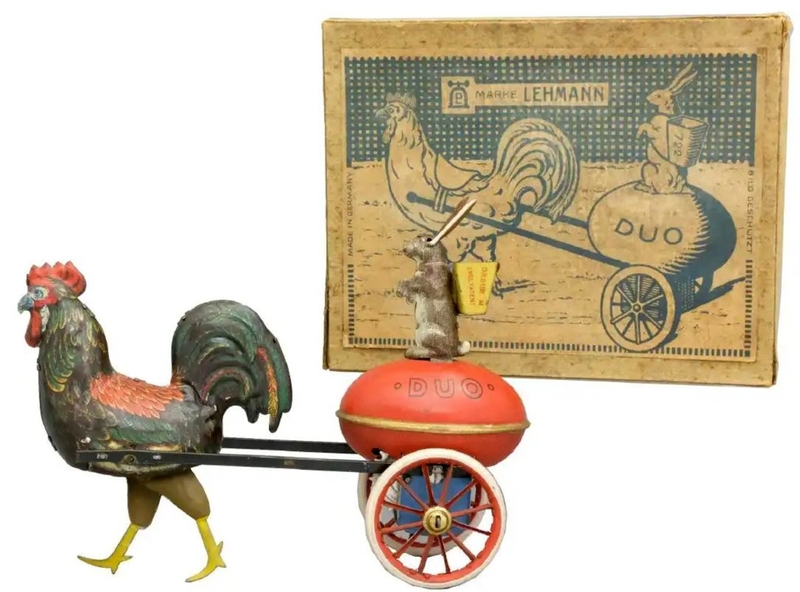 Offered on day one was the Elliotte and Liz Harold collection featuring more than 700 still banks in cast iron, spelter, ceramic, bisque and tin in thematic forms that ranged from animals, figurines, transportation, architectural, appliances and advertising. 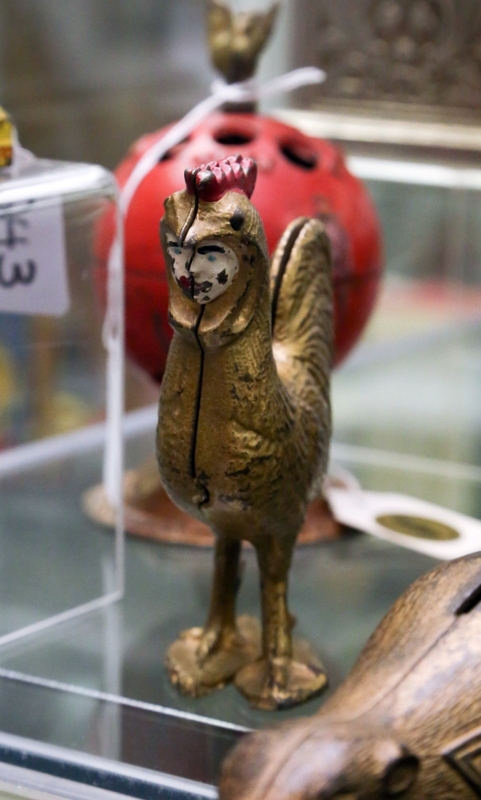 The collection also included examples of African Americana and cast iron paperweights, bottle openers, pencil holders and other small accessories. Anyone involved in the still bank collecting community or the Still Bank Collectors Club of America will recognize the Harold name. 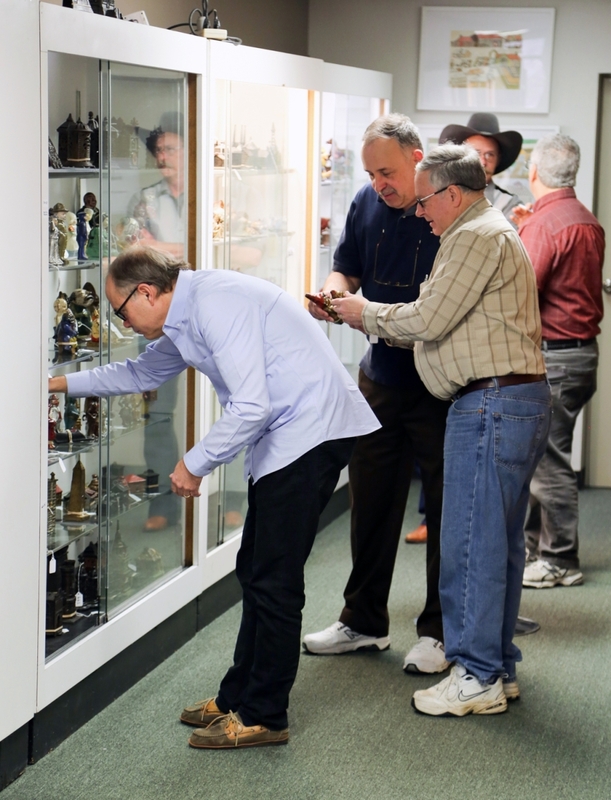 The New Orleans couple had been amassing their collection since the 1980s and have since become very involved in the genre’s community. 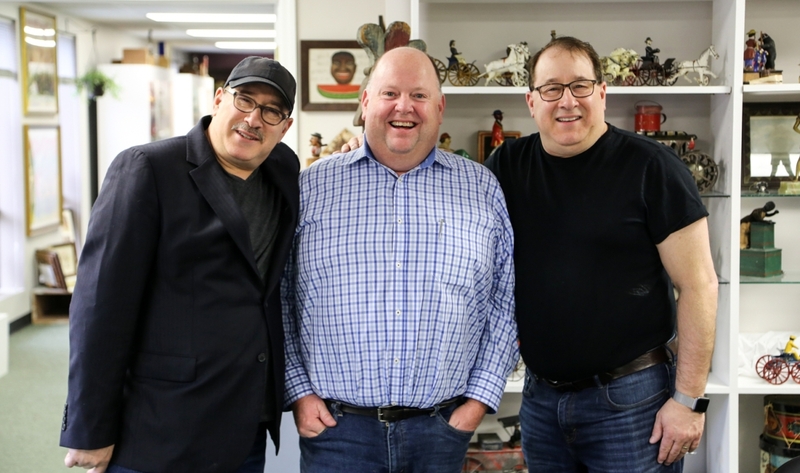 Elliotte was president of the Collectors Club for two years and chairman of membership for ten, while Liz has served as the organization’s magazine editor for five years. Both have served on the board. 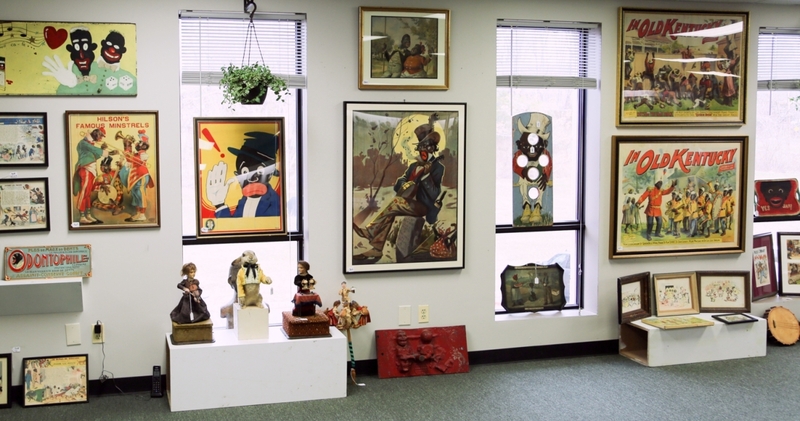 Speaking with Antiques and The Arts Weekly at the sale, the Harolds stated that they were downsizing from their large home of 45 years and felt it was the right time to disperse. 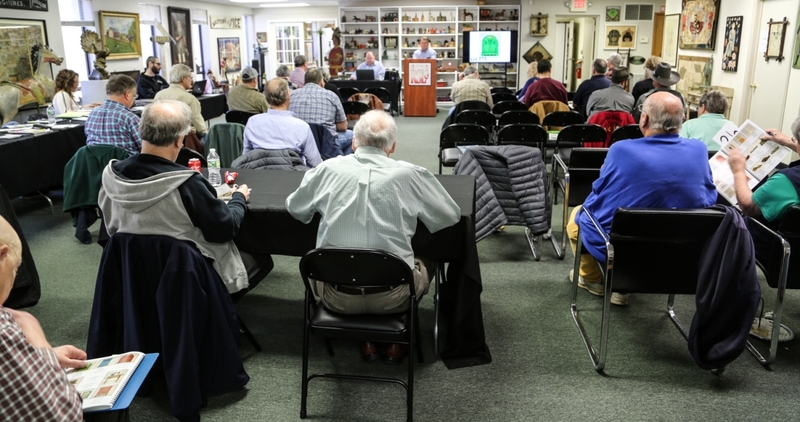 Elliotte recalled their hunting grounds as anywhere and everywhere – auctions, dealers, friends, the still bank convention. When Hurricane Katrina ripped through New Orleans in 2005 and dropped a tree on their deck, they decided to build out walls and turn that space into their collection gallery. 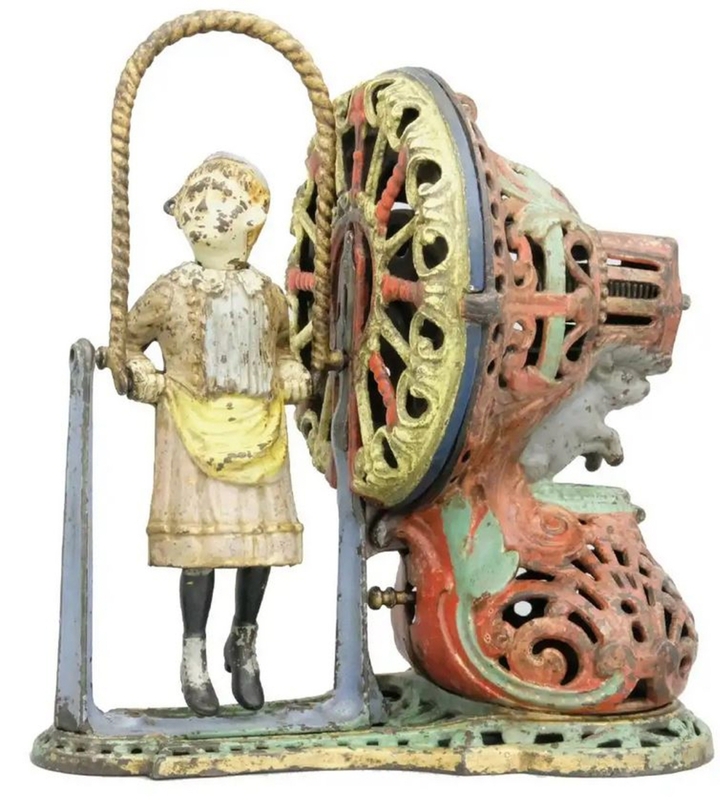 This Doll in Swing by Lehmann set an auction record for the model at $13,200. 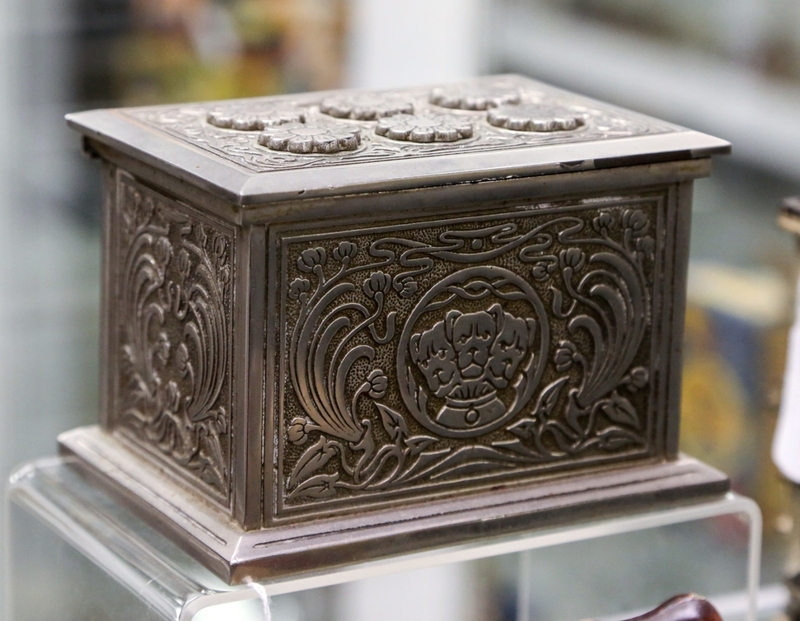 According to the auctioneer, its box is the only one known to have survived. Rarity and condition drove the two-day sale’s top lots and the results from the Harold collection were no different. Two still banks tied for the lead at $13,200: a beaver and a Santa Claus with Tree. The cast iron gold-painted beaver, a circa 1920 Canadian model imprinted “W.S.S.” on its side – used for War Savings Bond sales to finance Canada’s expense of World War I – was a world auction record for the model. It was graded excellent plus and featured provenance to the Robert McCumber collection. 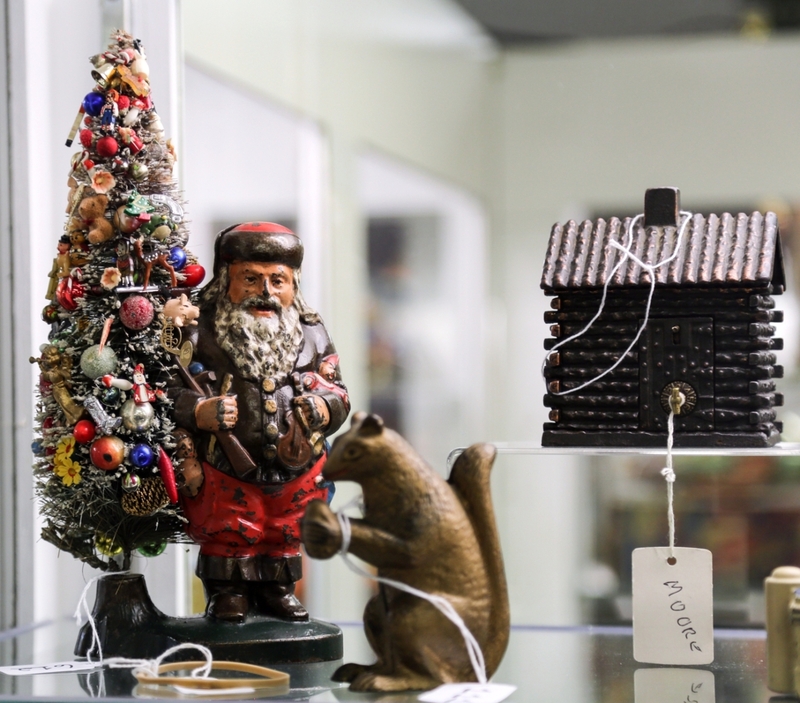 The multicolored Santa Claus with Tree by Ives, Blakeslee & Co., in pristine condition was also a cast iron example and came with provenance to the Andy and Susan Moore collection. Auctioneer Doug Riat, who called day one of the sale, told the audience that Susan Moore made the tree and had placed every detailed ornament on it herself. Santa, with his red pants and brown jacket, is featured bursting at his seams with toys as he holds a doll, violin, toy rifle and hammer in his arms with dolls popping out of both of his pockets. Leon Weiss said only four to six multicolored examples of this bank are known. Following behind was the second highest price ever achieved for AC Williams’ cast iron Chanticleer still bank at $12,000. The bank featured bright gold paint and was graded excellent plus, one of the finest known. Seemingly out of the Harry Potter universe, a rare cast iron six-dial safe bank with a picture of a three-headed dog on its front panel, the only one that the auctioneer had ever seen, came in at $9,600. The American bank was graded pristine, circa 1895, and sold to an absentee bidder. Other safe banks that performed well included a J&E Stevens cast iron Geometric Safe, graded excellent, $2,400; a nickel-plated cast iron example of the Shimer Toy Co’s Paul Jones Bank, graded fine, $2,160; and a J&E Stevens brightly stenciled Door Safe in the large size with recessed knob, $1,200. The Harolds’ collection featured a colorful menagerie of animals, many of them in 90 percent and higher paint and a number of models in rare color variations. 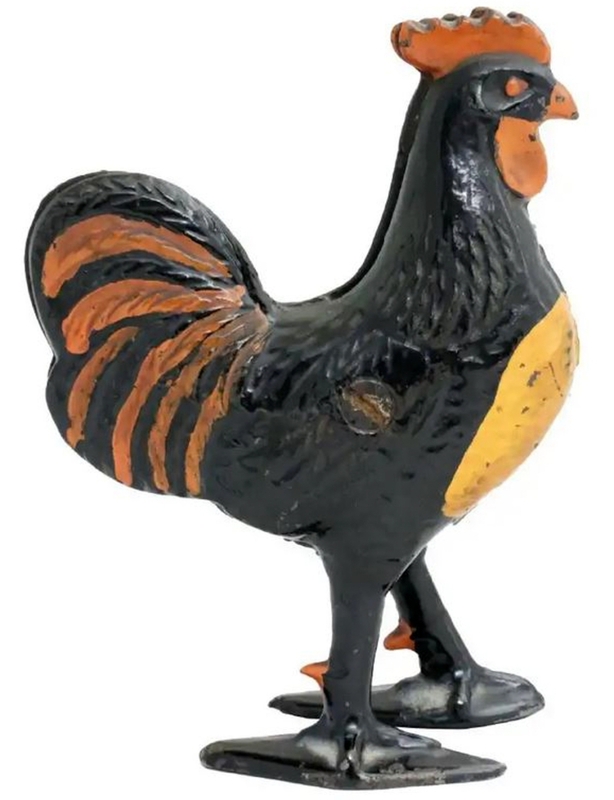 Notable here was AC Williams’ Rooster with Orange Highlights in pristine plus condition, circa 1920, that sold above its $800 high estimate for $5,400. 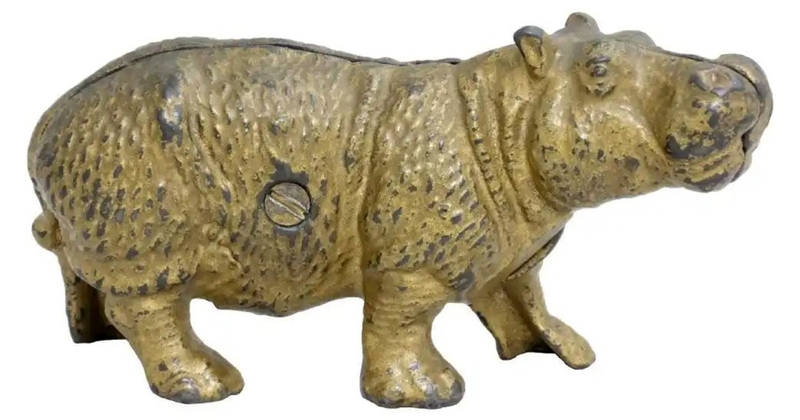 The auctioneer called it “without question the finest example of this bank that we have seen.” Behind at $6,000 was a gold-painted Hippopotamus by the Ober Mfg Co., circa 1905, in excellent plus condition and featuring provenance to the Donal Markey collection. 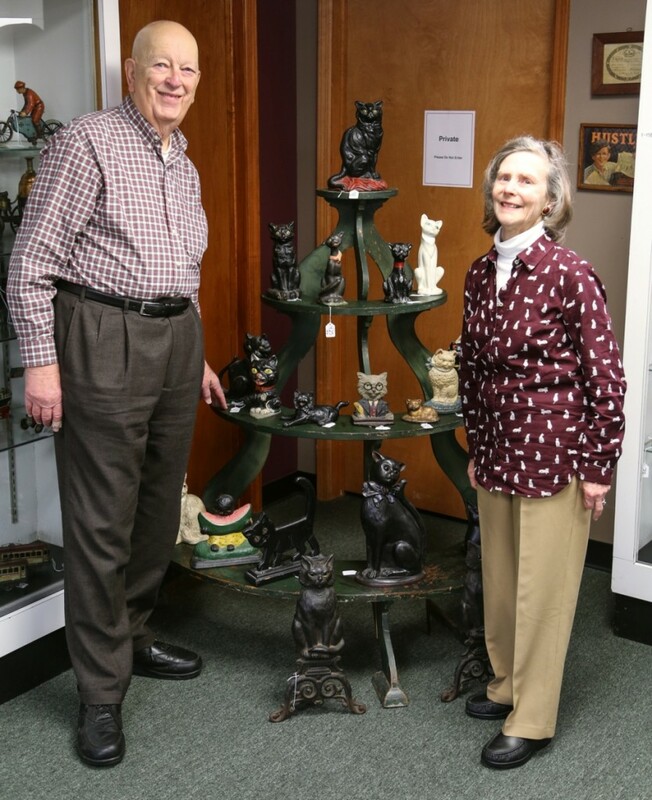 Elliotte and Liz Harold, whose single-owner collection represented 691 lots of the sale’s first day, stand with their collection of doorstops before the sale got underway. 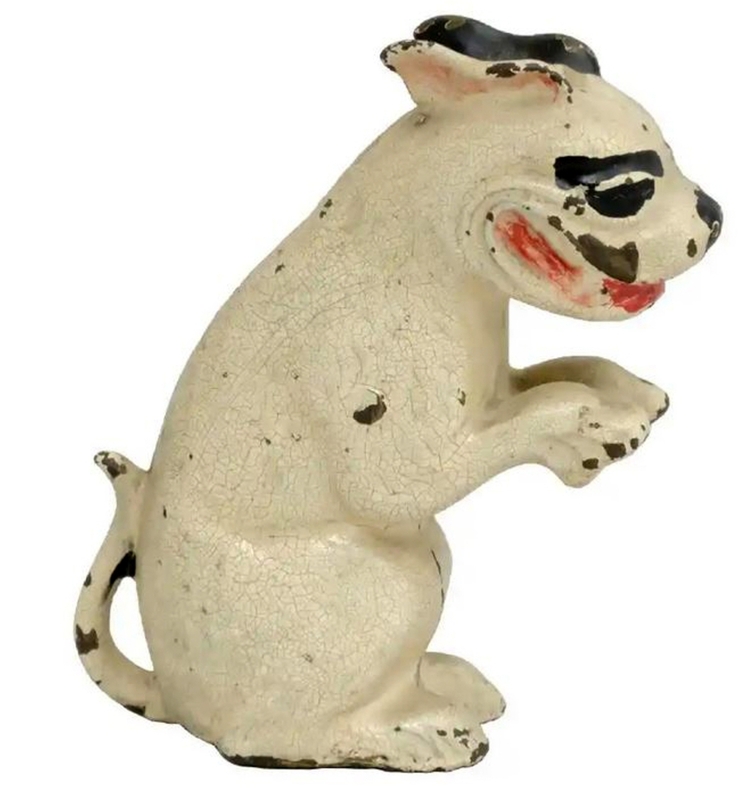 Another cast iron Ober bank would produce a record result; this one a multicolor Bear Stealing Pig, the bear painted black and the pig white, that sold at $3,900. 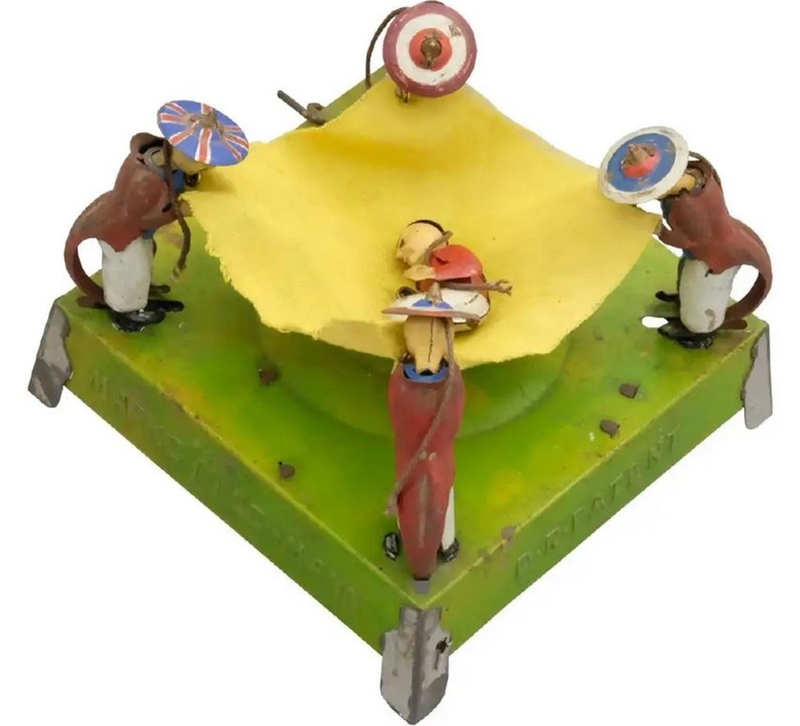 Another world record came in the form of the Snickering Bonzo, thought to be an AC Williams prototype and the only one known, graded near mint, that sold for $3,120. The Bonzo had provenance to Bill Robison, who bought it and its wooden mold at a factory sale in the 1970s. Architectural forms rounded out the collection and were led with an auction record for the Kyser & Rex Ironmaster’s House in large size and with a combination door at $6,000. At $3,480 was a circa 1893 Chicago Bank by John Harper Ltd, Willenhall, England, with its original flag. Others included a Kenton Hardware Columbia Bank in the second largest size, cast iron and circa 1893, an auction record at $3,000; the second-to-last bank of the day, a Century of Progress bank from the Arcade Mfg Co., circa 1933 and in pristine plus condition, $2,520; and the Eiffel Tower bank in the rare large size, English, circa 1900, in a Japanned finish, $2,280. 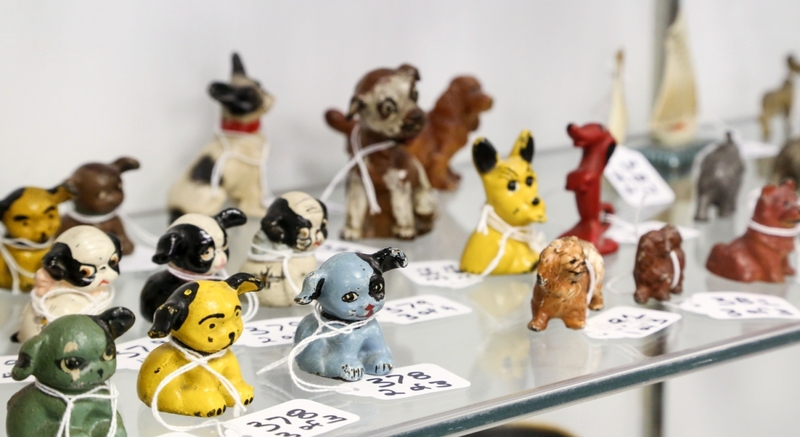 Approximately 80 percent of the 589-lot second day of the sale was from the collection of Sandy Fubini, who collected German and Japanese windup toys. Bidders confirmed that with strong results. Based in Spain, the Paya Mfg. 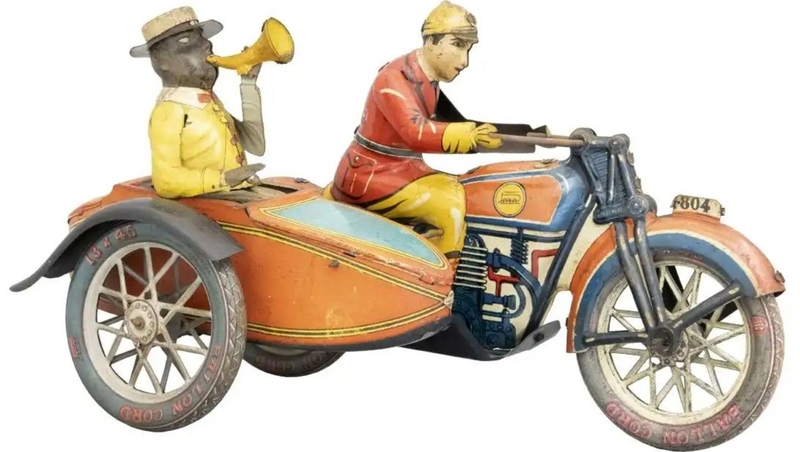 Co’s tin motorcycle with side car is one of the scarcest tin toy motorcycles ever produced. It sold for $9,000. 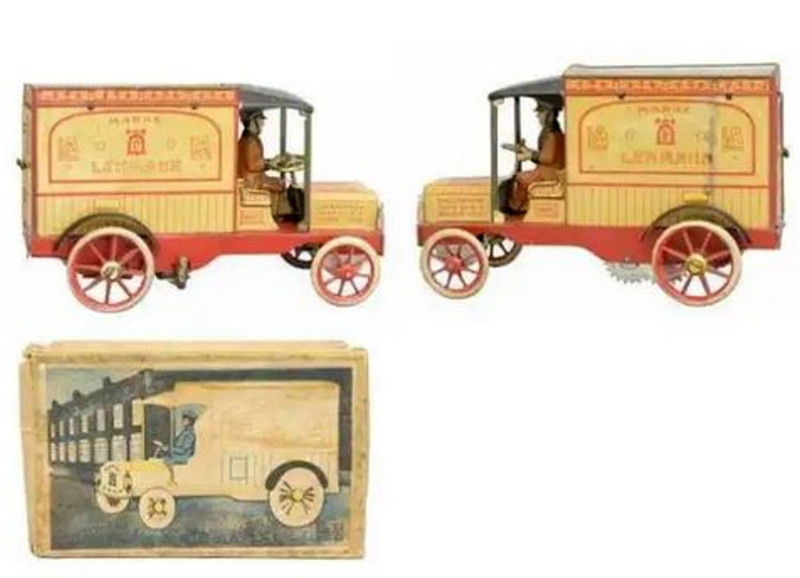 Three Lehmann tin toys lead Fubini’s collection, including a $14,400 result for a Lo & Li example in pristine plus condition, produced between 1924 and 1938. 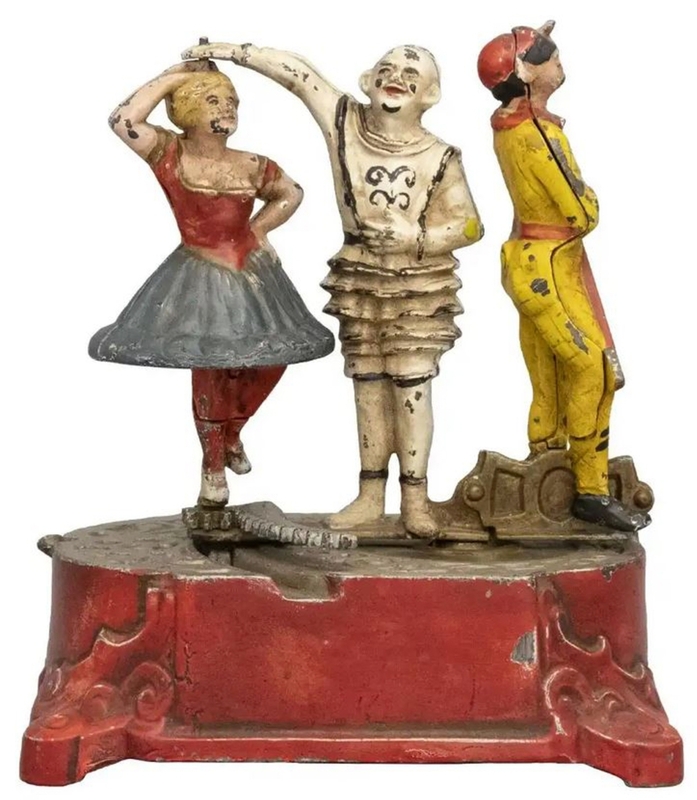 The auctioneer called the toy, which featured a sitting clown playing the accordion (Lo) with a dancing busker (Li) “one of the rarest tin novelty toys to ever cross the auction block.” Behind at $13,200 was Coco, a near mint boxed example. 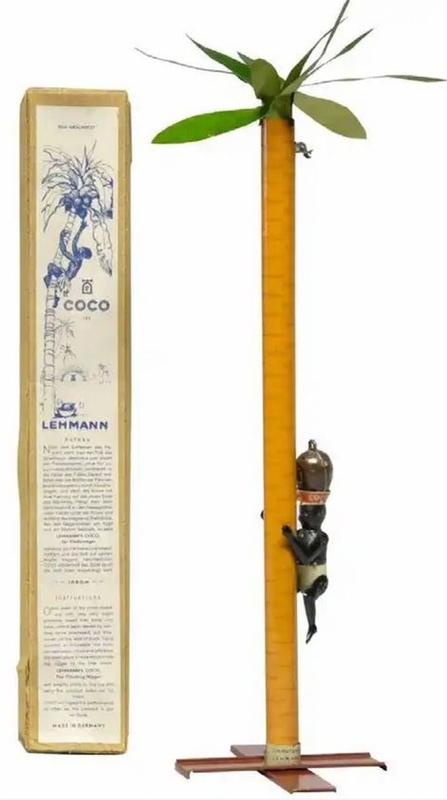 Coco had a long production run stretching from 1889 to 1935, and this model was from later in the period as there are no leaves decorating the base. 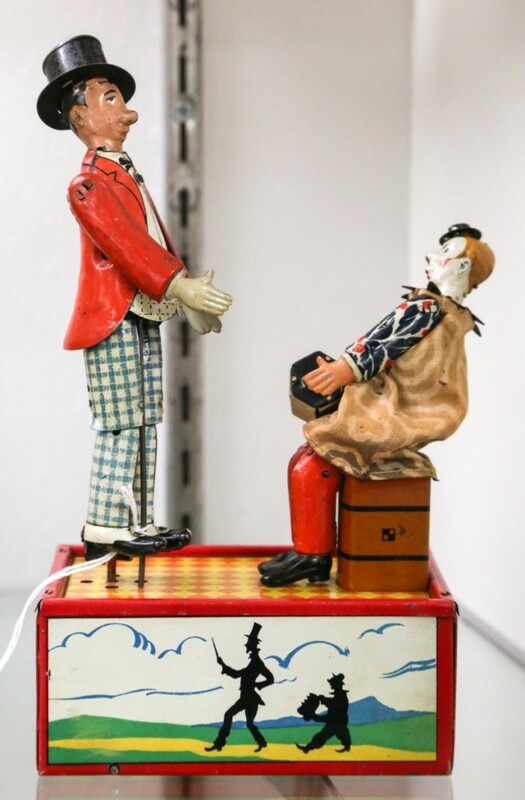 Setting an auction record at $13,200 was a Doll In Swing, which was, according to the auctioneer, accompanied by the model’s only known box. 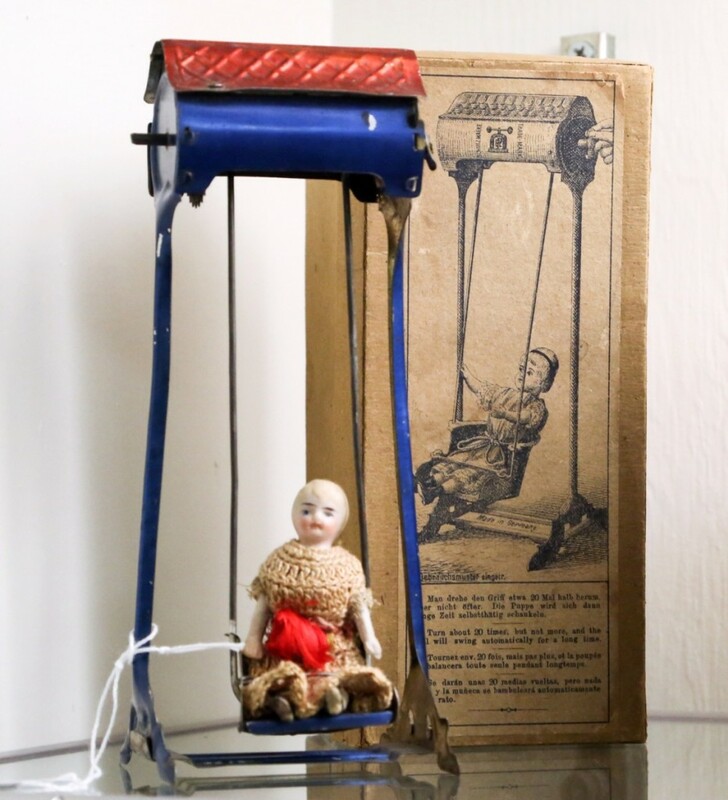 Ernst Paul Lehmann began producing toys in 1881, the Doll in Swing represents an early model for the maker as it began production in 1894 and was only made until 1899. From other consignors came a collection of mechanical banks with a number of notable results. The category was led by a J&E Stevens Girl Skipping Rope bank in very fine overall condition, which brought $12,600. The same model in repainted condition would bring $7,800. By the same maker was the Lion Hunter bank in pristine and bright condition, which sold for $10,800, and the Dentist bank in very fine condition, $7,200. 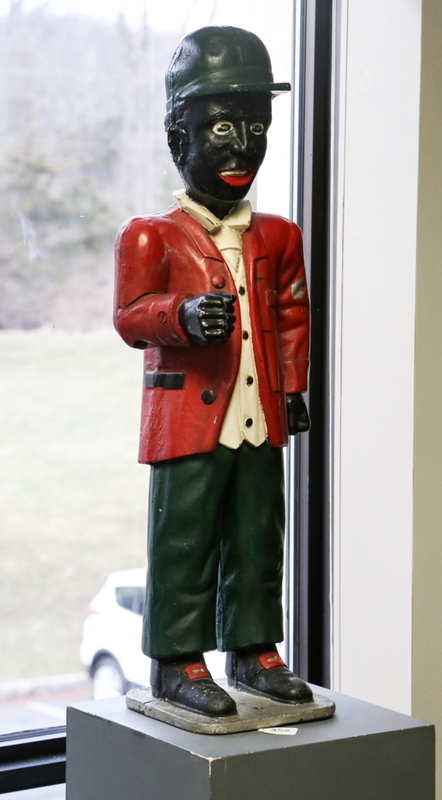 One of the later banks in the sale was the famed Clown, Harlequin and Columbine bank, second casting and circa the 1950s, that brought $7,800. 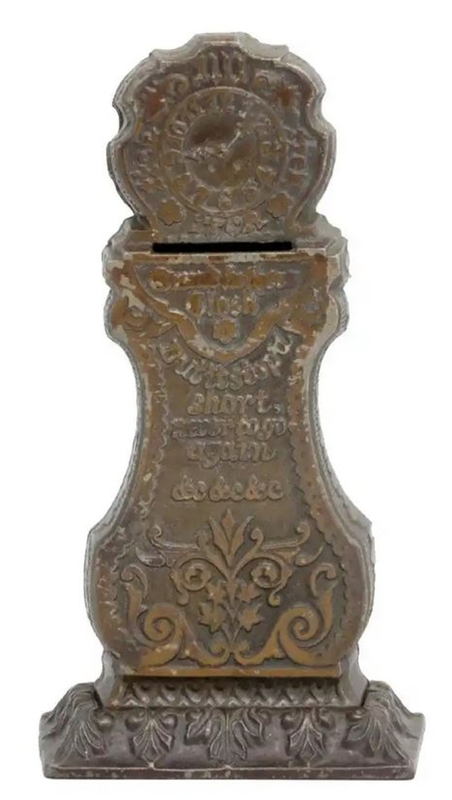 The catalog noted that it was probably made by Mark Haber, and correspondence exists of him owning and offering for sale the J&E Stevens bronze pattern mold for this bank. 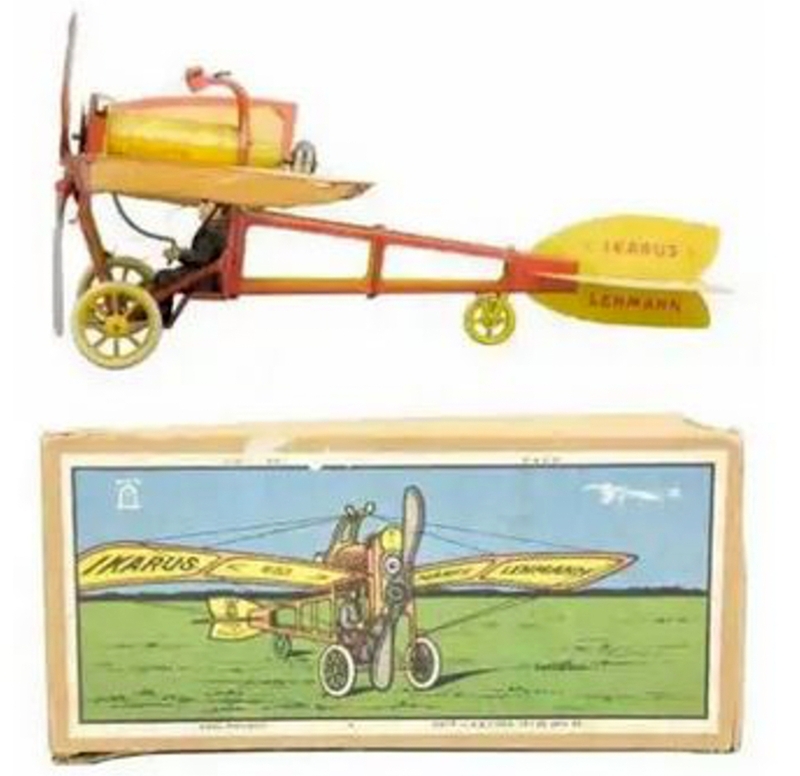 RSL’s next sale will take place June 1 and includes the Norman and Mary Jo Bowers still bank collection, the mechanical bank collections of Dr Morton Kramer and Arielle Kosloff and part two of offerings from the windup toy collection of Sandy Fubini. All prices, as reported by the auction house, include the buyer’s premium. For more information, www.rslauctionco.com or 908-823-4049. Santa Claus with Tree by Ives tied for the top lot from the Harold collection of still banks at $13,200. The cast iron example had provenance to the Andy and Susan Moore collection and it was Susan who made the elaborately decorated tree. Multicolored examples of this bank are rare.